Low clouds greeted us this morning. Not too cold and an occasional mist and light rain. We made the most of the morning by doing nothing. About 11AM we begin to muster for a Kayak around Laura Cove at low tide. While not the best Kayaking grounds, we nevertheless made the most of it by exploring the shallows and taking a few pictures. 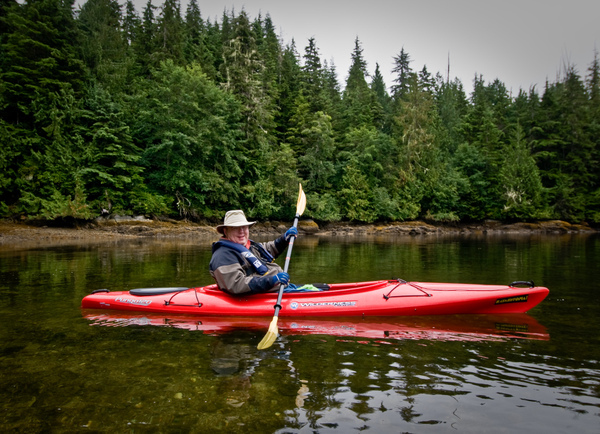 Karen made certain she got one photo of me in the Kayak to quench the cries of “where are the pictures of Bob?! ?” that typically accompany our vacation photos. Our neighbor returned from one of his fishing expeditions and was busying himself on the stern swim step of his Uniflite Cruiser named Rockfish. Karen and I paddled to his boat to investigate. He was busy cleaning a 25lb Ling Cod. An ugly fish for certain that hangs about on rocky ledges. What it lacks in looks it makes up for in taste. We hung around the stern of the boat getting a lesson in fish filleting – then low and behold, we were offered a filet of our own. Lacking any fresh seafood on board, we did not turn down the generous offer. What a big Ling Cod! Our departure to Booker Lagoon was dependent on the proper time to enter the lagoon through Booker Passage. This narrow passageway has currents that run strong and is best traversed at slack water. Therefore, we set the power low and had a leisurely cruise off to Booker Lagoon. As we departed, we radioed the vessel Rubenesque, offering up our just-vacated prime anchorage. 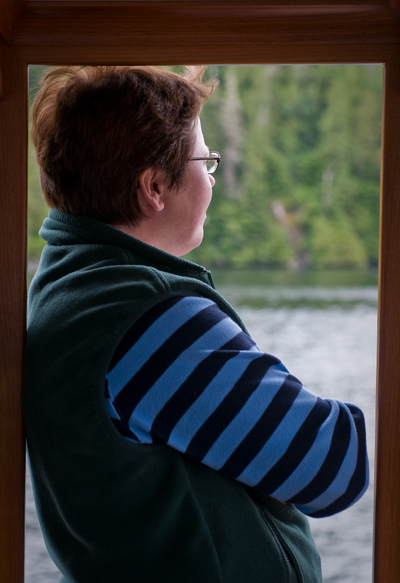 As we approached close to Cullen Harbour and Booker Lagoon, we started to feel some swells from Queen Charlotte Strait. The Lagoon itself is massive, and a favorite spot to wait before crossing this oft-windy and swelly Strait. We waited for “slack”, and although the guidebooks told us to wait for 30 minutes after slack at Alert Bay, it was clear that we could enter sooner, which we did. The passage is narrow but fairly deep. As we moved into the passage, we saw a large group of porpoises chasing baitfish inside the Lagoon. Booker Lagoon is so massive that it took us a while to find a spot to anchor that was cozy enough for our taste. 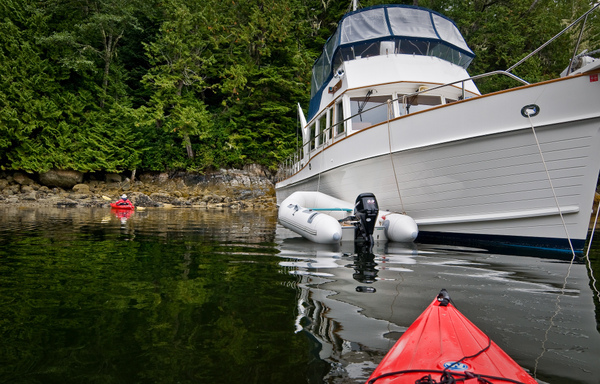 We poked our bow into a couple of coves but they were just too open and ordinary. Finally, we found the perfect spot in a cove on the North side. 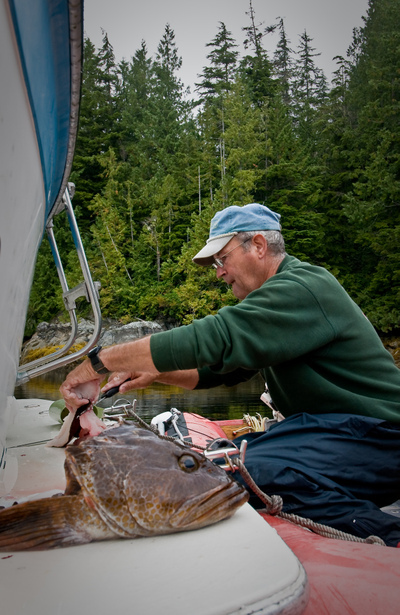 Anchor set and beer in hand, I’m off to determine how I’m going to prepare that fresh Ling Cod.